Best way to visualize route frequency on a map? I have a map that displays flight routes. Now I'd like to indicate that some routes are operated more frequently. How to visualize the frequency so that the user is able to distinguish between frequent and less frequent routes? Stroke width and color gradient are good choices, because you are dealing with ordinal data. Dotted/dashed line would not be a good choice for ordinal data. Since you want the user to be distinguish frequent from less frequent routes, you need to choose a visual property that represents ordinal data. Ordinal data is typically separated into natural, ordered categories, where the distances between the categories is not known -- for example small, medium, large. It is distinct from quantitative data. 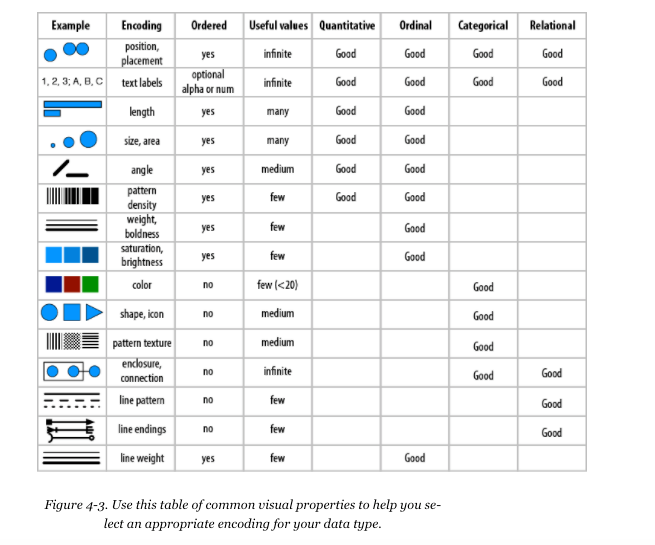 Whether a visual property has a natural ordering is determined by whether the mechanics of our visual system and the “software” in our brains automatically—unintentionally—assign an order, or ranking, to different values of that property. For example, position has a natural ordering; shape doesn’t. Length has a natural ordering; texture doesn’t (but pattern density does). Line thickness or weight has a natural ordering; line style (solid, dotted, dashed) doesn’t. Depending on the specifics of the visual property, its natural ordering may be well suited to representing quantitative differences (27, 33, 41), or ordinal differences (small, medium, large, enormous). The image attached is also taken from his book. It suggests that line weight and color saturation (gradient) are intuitive ways to encode ordinal data. Also shown in the image, a dotted/dashed line (line pattern) would not be a good choice for ordinal data. You have decent ideas but there are setbacks: some people (7% of men) are colorblind; thick lines may hide thin lines; and a circus of dash/dotted lines may cause headaches. Superimpose the flight value in a shape (ie circle) that is affixed to the flight path. Kind of like road maps shows the Route Number on a road. If there is not enough room for a bunch of "dingbat numbers," then offer a toggle to turn them on/off by clicking on the path (or a master switch elsewhere). So why not have the most popular routes in an ordered list in a sidebar to the left/right of the map? Have linked interactions so selecting / hovering on a route in one view highlights it in the other? Not the answer you're looking for? Browse other questions tagged info-visualisation maps or ask your own question. How should I visualize the frequency of events? Why are election results presented by a geographic map instead of a cartogram map? What is the best way to present map tools on a map in a mobile application? What's the best proportions for coloring a clustered map? Best way to visualize multiple data points on a graph?